At the Local Sustainabilty conference in Freiburg last October, I met Drs. Hugo Niesing of Resourcefully, who was speaking about experiences with smart energy technology in ports and harbours – places where heavy and intermittent industrial energy demand is located close to the point of delivery of offshore renewable power. Later, he told me about energy management on a more modest scale: about his domestic electricity supply arrangements, which are quite different from what most people in the ‘developed world’ have. Hugo has 4kW of photovoltaic generation capacity on the roof of his boat. 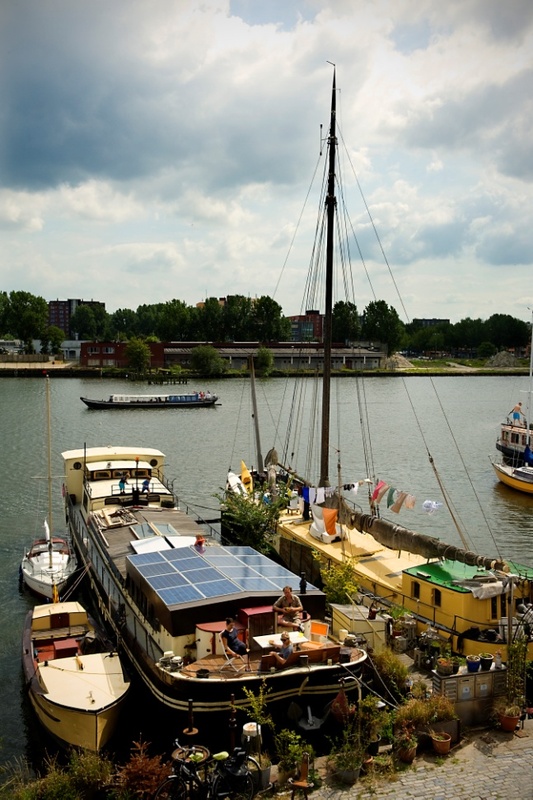 Yes, Hugo lives on a houseboat, in the old harbour area of Amsterdam. When Hugo moved into his boat in 1989, the harbour berths were off-grid. 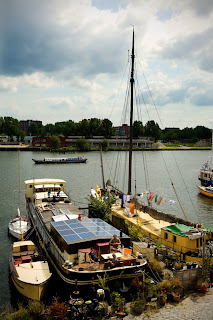 His neighbours were other boat owners, each with different local generation capabilities. The local feeder for this neighbourhood was a patchwork of 220V cables, patched together manually as the need arises. A neighbour would spread the word that he’d got spare generating capacity. The wires would be rearranged, and a few local boats would charge their batteries. Later in the day, the generation might be from a different boat, and the wires would be rearranged. My first thought was that Hugo’s situation was really not relevant to the studies of Local Energy Markets that I’m making with the LEMMA consortium. There was no metering. There was no fixed local feeder. Most decisively of all, there were no contracts and no money. The whole thing worked by goodwill and community spirit. But later I realised that Hugo’s boat pointed out a huge limitation of our present centrally controlled energy markets: they assume that all householders are only willing to exchange energy in the context of an enforceable contract, and that all householders are willing to use money as their medium of exchange. Hugo’s neighbourhood showed that neither of those assumptions is valid. There’s been a significant movement towards social diversity over the past fifty years. In the UK there has been great diversification of colour, language, religion, culture and lifestyle. Politicians are aware that inclusivity of all citizens is critically important for government. Many businesses have adapted to serve this diversifying market. In food, there are vegetarian restaurants. In finance, there are now Sharia-compliant mortgages. In retail, there are shops for cultural minorities. In telecommunications, there are networks optimized for the service and language needs of immigrant communities. But in energy, everybody is assumed to be the same. In 1995, when grid electricity came to the old harbour of Amsterdam, the force of convenience overcame the forces of diversity. Hugo and his maritime neighbours now have smart meters, a local feeder, and the same monetary trading arrangements as everybody else. But the existence and successful operation of their off-grid market shows vividly that there is more than one way to exchange energy. If people want to do things in a different way, it’s technically and socially possible. The forces that promote uniformity in energy markets are regulation and convenience: neither of those may persist in its present form. When the energy industry wakes up to the conditions of the 21st century, we may get specialized energy markets, aligned with the concerns and capabilities of our diverse communities. Where communities are localized, as many are, specialized local energy markets may be the ideal way to enable, for the business of energy supply, the diversity that UK society is developing, and the inclusivity that it will need. Looking further afield, it’s clear that the distinguishing feature of most ‘developing’ countries is their very marked social diversity. In these countries, the gap between the city-dwellers and the country folk, the gap between the educated and the ignorant, the gap between the rich and the poor, and often the depth of isolation between faiths, is far greater than in the UK. Local energy markets, with their capacity for being configured to address the specific interests and concerns of local communities, may be a vital enabler for energy market development in the developing world. Photograph copyright © Hugo Niesing 2012. Used by permission.